Vinasen is getting married this weekend, so of course there had to be a bachelors ("Junggesellenabschied"). 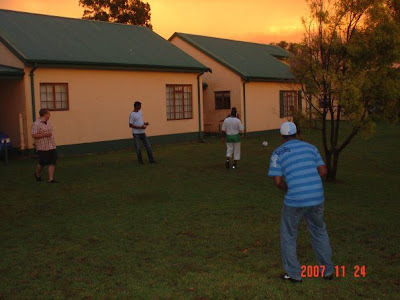 For one night we (about 20 people) drove to warmbaths, about 2 hours away from Johannesburg and known for its warm springs and temperatures where Kevin (Vinny's brother) had organised a few chalets for us. To check out a few pictures (courtesy of Alan) click HERE. Thelo and I are going to fly down to Durban this weekend for the wedding, I am very much looking forward to it (my first Indian wedding, and they are usually big) as well as a long weekend because Monday is a public holiday.